After just 3 hours at the border crossing Canada-USA we were admitted into the USA with Frida and Freddie and all our stuff minus one lemon and 10 dates (from the Middle East…). Now heading for Seattle to visit Reimer, buy some more mountain gear and make a small check-up on Frida! Another peak conquered! We made it to the top of Mount Rainier, 4392 m, in very strong winds and extreme cold (the water froze in the the bottles inside the rugsack). We will post text and photos as soon as possible! Mount Rainier, the conquest of the useless? Some would call it a conquest of the useless inspired by the book by Lionel Terray, but for those who know the feeling of reaching the summit of a mountain after a hard climb, the term useless does not exist. Mount Rainier, 4392 m, is an inactive stratovolcano located in Washington State in the northwestern corner of the United States. It is part of the Cascade Volcanic Arc and rises an impressive 4027 m above the surrounding topography, which makes it the most topographically prominent peak in the USA and more topographically prominent than even the K2. 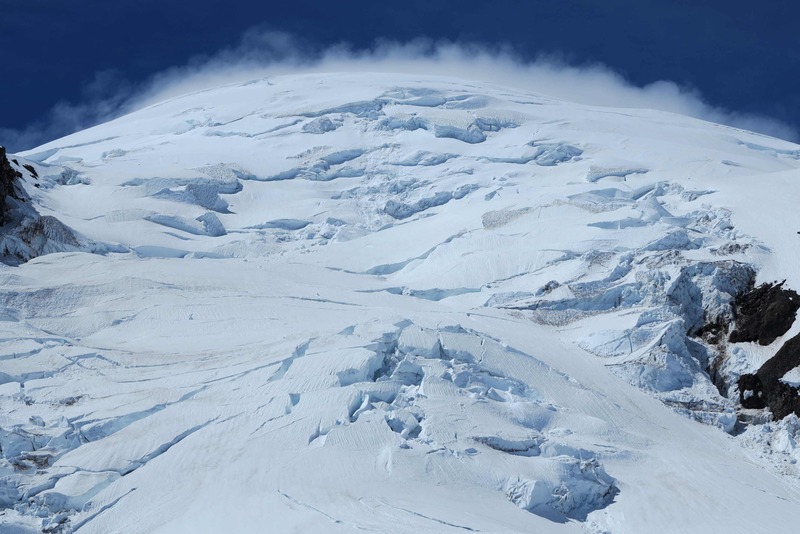 Mount Rainier has two peaks separated by a large crater filled by permanent ice. It is considered the Mont Blanc of the United States for its beauty and level of difficulty in reaching the summit and even though it is not as high as Mont Blanc, the mountain has its own challenges in climbing that should not be underestimated. From the start of the trail at the Paradise parking lot, it is an ascent of almost 3000 m to reach the summit. 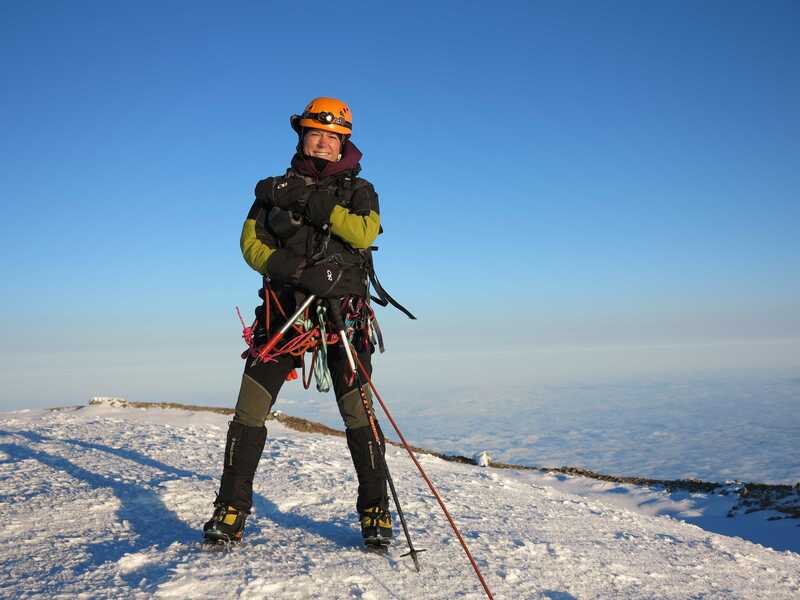 Fierce and icy winds hit the mountain straight on from the vast Pacific Ocean and the inattentive climber could loose his way on the bare and even slopes of this enormous stratovolcano. A large number of glaciers are fed by the high snowfall over Mount Rainier. We decided to climb the mountain from the Ingraham Glacier, following the Disapointment Cleaver route, which is the normal route. The weather was forecasted to be good on the day when we started the ascent, followed by a day of thunderstorms and then a day of clear skies. So we spent the first day ascending from Paradise to Camp Muir and the second day we took the opportunity to continue to the higher camp on the Ingraham Flats when the weather cleared up a bit. On the day of the summit we woke up at midnight to a brilliant night sky of 1 billion stars. Under this vast eternity we started the climb at 01.15, counting the shooting stars as we slowly ascended the Disappointment Cleaver and went onto the long, straight, ice covered eastern slope of the mountain. Once we reached the bare slope we were surprised by an incredibly cold and strong wind, which continuously hurled snow and ice into our faces for the next 3 hours. The strength of the wind and the icy temperatures sucked out most of our energies during the otherwise nontechnical ascent and we saw many groups of climbers who decided to turn around. But being a very stubborn dane and an incredibly obstinate bergamasco we bend our heads deep against the wind and continued to the top! At 05.30 we were the first to raise our ice axes at the Columbia Crest summit of Mount Rainier, exhausted by the cold and the wind – but incredibly happy. The sun was rising and slowly warmed out icy faces and the mountain rewarded us with a beautiful view for hundreds of kilometers in each direction. 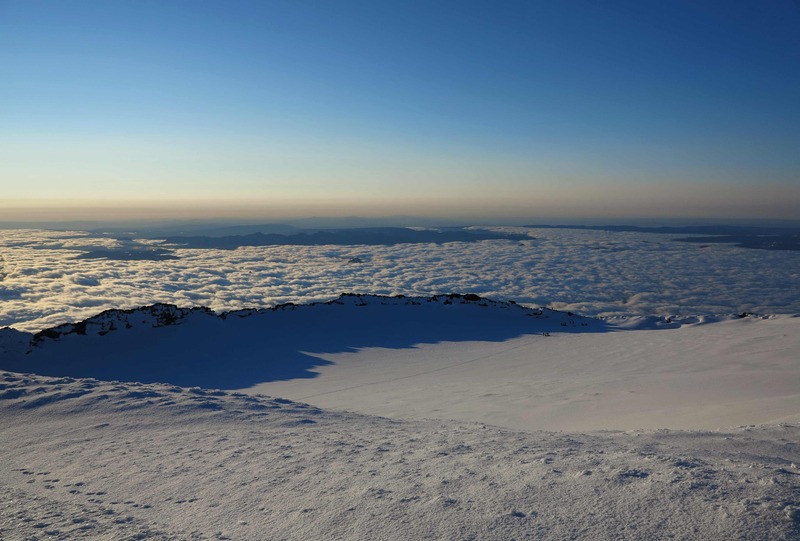 We could clearly see Mount Adams, Mount Saint Helens and Mount Hood (165 km distant) rising above the clouds in the distance. At this moment, the word useless was not part of our vocabulary any longer. Mount Shasta or Monte Vesuvio? When we decided to climb Mount Shasta, a 4322 meter high stratovolcano in California, we would never have thought that we would end up thinking that we were instead on Monte Vesuvio, a volcano in south of Italy! Arriving at the Mt Shasta basecamp at Helens Lake after a very hot and dusty trek, we discovered that we were sharing the camp with an Italian coming from Castellamare di Stabia, a beautiful town in the Gulf of Naples, in front of the Monte Vesuvio! And after climbing with him to the top, listening his nice napoletano accent, we were in doubt!?! Are we climbing Mount Shasta in California or Monte Vesuvio in Campania? We would like to thank and congratulate our napoletano friend on the ascent to the summit!!! The climb was quite hard even if the route is not technically demandant. On the summit day, we made a steep ascent of 1200 m followed by a total descent of 2200 m to the car. The view from the top was beautiful! 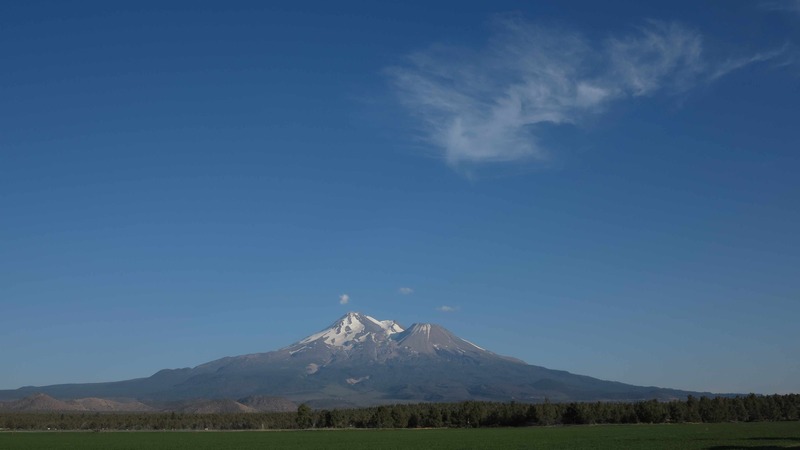 The last half of the descent was hot and dusty and when we arrived to the small town of Mt Shasta, we had no choice but to rinse our dry throats with a large and ice cold jalapeno beer followed by an enormous burger with garlic fries….. So finally, we were in California and not in Naples! See you later, Miss Whitney! Sometimes the best thing to do is to “give up” but it is not easy for those who are continuously chasing another “conquest of the useless”! Still, it is a good thing to learn. Mount Whitney is a giant and beautiful granite peak of 4,421 meters, the highest mountain in the contiguous USA (US minus Alaska). Its jagged crest rises like a bright rock castle above the sizzling hot Californian desert below. 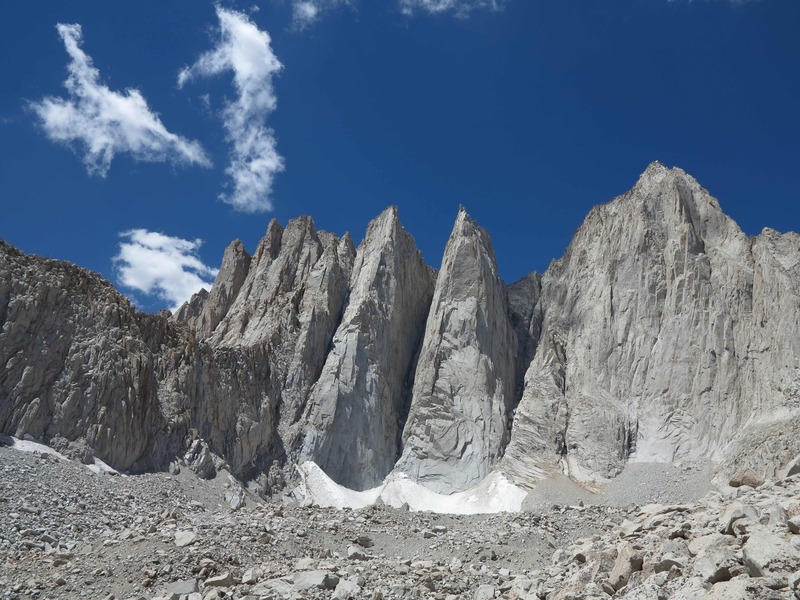 When we arrived to Lone Pine, the small town at the foot of Mount Whitney, we were honestly speaking quite tired of carrying the heavy rugsacks up the mountains, so we decided to climb Mount Whitney in only one day using the mountaineering route on the north side of the east face. Soon we would learn that this was going to be a tough adventure. We knew that it would be a very long day, gaining some 2000 m in altitude from the campsite to the top and with some scrambling above 4000 m to get to the summit. But the temptation to climb the mountain with the light daypacks and without all the overnight equipment was too strong. Already on the way down the mountain, the weather proved us right. A big dark cloud quickly built up over the summit and we could hear the thunder rolling down the valley. It is not at all satisfying to gain 1600 altitude meters without attempting to reach the top, but it is always satisfying to get down the mountain safe and sound. We just have to say, “see you later, Mount Whitney!” It will not be our last mountain to climb and neither the last mountain where we will have to give up. Now we are heading to Mexico, hoping that the rainy season will still allow us to climb some volcanoes and maybe even the Orizaba Peak. Tomorrow we are leaving the US and entering Mexico! We are very excited and looking forward to treating ourselves to the delicious Mexican food and drinks…..and to relax a little bit on the beach after all our struggles in the mountains. Now we are in the very southern part of California, about 100 km north of the Mexican border, camping by a beautiful lake. It is 8 pm, the sun just set and it is still well over 30 degrees. 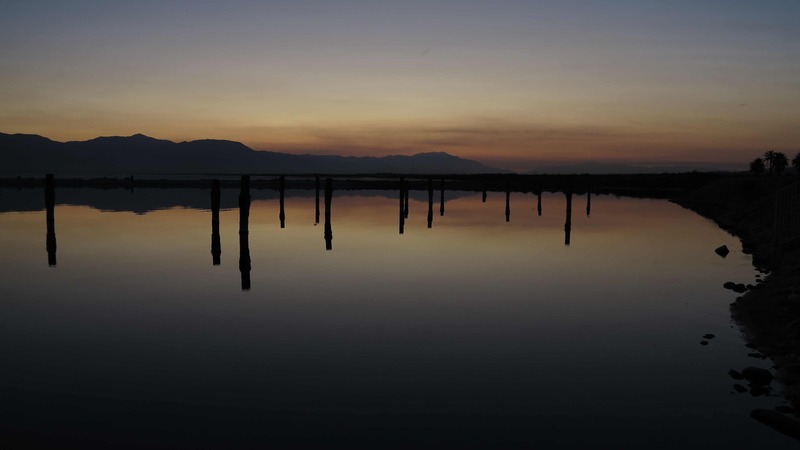 Not a wind, the lake is like a mirror. It is hot! We are thinking back to Canada, how it was raining 80% of the days we were on the road there, how we were struggling with trying to dry our wet clothes and boots and cooking under the small tent that Marco had constructed at the back of Frida. Then we bought a tarp! And then we mounted an awning (“persienne”) on Frida, 2.5×2 metres!!! Our lives were revolving around how to live comfortably on the road under all this rain! No matter the rain, Canada was beautiful, or more specifically we loved British Columbia. We could have spent another month there exploring the mountains and the lakes. But we had to move on so we entered the US on Friday the 13th of July. In the beginning there was not much change to notice, the northern part of Washington was as beautiful and green as the British Columbia we had just left. And it rained! But then we started driving down along the coast of Oregon with its steep dark cliffs and white beaches and the continuous roar of the waves rolling in from the Pacific Ocean. Lovely! But still cool. As we entered California we turned east away from the coast and drove through a beautiful tall redwood forest. We crossed a small mountain chain (the Siskiyou Mountains) and as we drove down into the valley on the other side, the whole landscape changed to being much more dry. And it was getting hot! Then we drove down south along the Sierra Nevada Mountains from Mount Shasta to Mount Whitney. On one side of the road mountains, on the other side desert. In Lone Pine it was getting very hot and the “western movie” hills were bare and dry but we could escape into the cool granite mountains. As we drove down towards Los Angeles we saw the first joshua trees and we just had to turn on the air conditioning again! Los Angeles was a pleasant and strange surprise. The historic downtown is full of old metropolis buildings from the 1920’s/30’s. 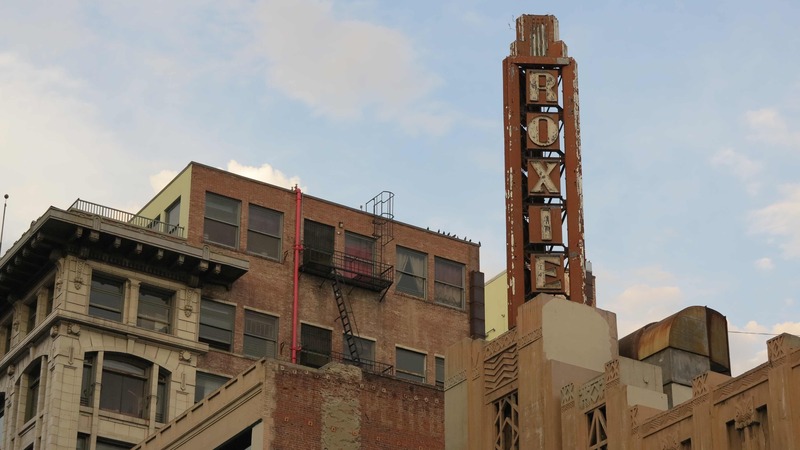 And Los Angeles is just bustling with people so diverse and so radically different from the two of us that is was an experience just to walk down the street or take the metro. It strikes you how homogenous we are in both Denmark and Italy, unconsciously following the unwritten rules of how to behave in our own “tribe”. Los Angeles is a freak show in comparison! We left the city of fallen angels this morning and as we drove south the temperature just kept creeping up. Date plantations surround the small town where we are camping now and the local supermarket carries only Mexican products, it has its own tacos and nachos bakery and an enormous selection of chilis. It already tastes a little bit of Mexico and it is absolutely boiling hot! I told Marco to carry the wedge connection catalogue in his rugsack to the top of the mountain but he refused! Take care in KAZ!